PRESERVATION INSANITY: A million projects. I'm working on a million preservation/restoration projects right now, the vast majority of which are independent/experimental/artists' films. I was thinking of posting a list of a bunch of them here, and having folks who are interested pick a couple of titles that interest them, and I'll write a blog post about what's going on with those specific projects, archivally speaking. I would probably throw in some production info on the films too, in cases where I have info worth repeating. So hopefully this would not only be of potential interest to fans of this sort of thing, but also would give me "homework", which I think would compel me to be a bit better about writing out descriptions of each project, something I'm a bit behind on at that moment. What do you think? I'd have to limit it, though. Can't write on a ton of 'em! Some will be very basic, some will be very elaborate. Comments? 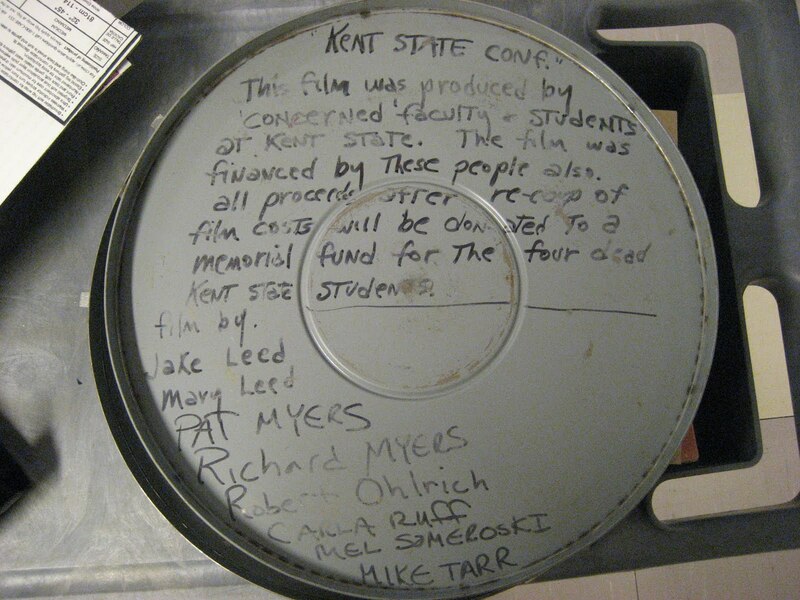 In the meantime, here's a picture of the inside of a can that contained a print of Confrontation at Kent State (1970) by Richard Myers et al. Mark, you're such an amazing writer about this stuff that I would love it if you opened up what you're working on. Long essays, short essays -- anything you'd provide would be greatly helpful and appreciated. I'll read whatever you want to write about. It's all really fascinating! I'd be really interested if you do provide details about restoration projects that involve cameraless films such as painted/scraped films. Greatings from a French film archive.